ORCID number: Don Cameron (0000-0002-3175-6965); Quak Seng Hock (0000-0003-4570-2375); Musal Kadim (0000-0001-7519-191X); Neelam Mohan (0000-0002-7055-192X); Eell Ryoo (0000-0002-0785-5314); Bhupinder Sandhu (0000-0002-5979-0823); Yuichiro Yamashiro (0000-0002-9679-8699); Chen Jie (0000-0002-4031-5619); Hans Hoekstra (0000-0001-7224-4758); Alfredo Guarino (0000-0003-0199-0336). Author contributions: All of the authors attended the working group meeting of international experts, and read, edited, and approved the manuscript at each draft stage; Hoekstra H and Guarino A reviewed and evaluated the literature, and designed the scientific program of the initial meeting in Paris at the Sorbonne University and the second meeting in Osaka. Supported by a medical educational grant from Biocodex, France. Conflict-of-interest statement: The working group meeting was funded by a medical education grant from Biocodex, France. Professor Yamashiro has received research funding from Yakult Honsha Co. Ltd. Japan. All other authors have no conflicts of interest to declare. Recommendations for probiotics are available in several regions. This paper proposes recommendations for probiotics in pediatric gastrointestinal diseases in the Asia-Pacific region. Epidemiology and clinical patterns of intestinal diseases in Asia-Pacific countries were discussed. Evidence-based recommendations and randomized controlled trials in the region were revised. Cultural aspects, health management issues and economic factors were also considered. Final recommendations were approved by applying the Likert scale and rated using the GRADE system. Saccharomyces boulardii CNCM I-745 (Sb) and Lactobacillus rhamnosus GG (LGG) were strongly recommended as adjunct treatment to oral rehydration therapy for gastroenteritis. Lactobacillus reuteri could also be considered. Probiotics may be considered for prevention of (with the indicated strains): antibiotic-associated diarrhea (LGG or Sb); Clostridium difficile-induced diarrhea (Sb); nosocomial diarrhea (LGG); infantile colic (L reuteri) and as adjunct treatment of Helicobacter pylori (Sb and others). Specific probiotics with a history of safe use in preterm and term infants may be considered in infants for prevention of necrotizing enterocolitis. There is insufficient evidence for recommendations in other conditions. Despite a diversity of epidemiological, socioeconomical and health system conditions, similar recommendations apply well to Asia pacific countries. These need to be validated with local randomized-controlled trials. Core tip: This paper includes recommendations based on guidelines and local data for use of probiotics strains in the prevention or treatment of intestinal diseases in children of Asia-Pacific region. Notwithstanding major differences in health management and local conditions between countries, recommendations for children living in various countries of Asia-Pacific region are similar. Saccharomyces boulardii and Lactobacillus rhamnosus GG may be used in gastroenteritis, nosocomial infections, antibiotic-associated diarrhea. Selected strains may have a place in infantile colic, Helicobacter pylori treatment, and necrotizing enterocolitis. This document provides a helpful guidance to use probiotics in children based on local data and considerations. Gastrointestinal illnesses are a major cause of morbidity and mortality in children in developing countries, with diarrheal diseases being one of the top five causes of death in children younger than five years. Worldwide, the most important enteric pathogen is rotavirus[2,3]; other major pathogens include Escherichia coli, Vibrio cholera, and Shigella, Campylobacter, Salmonella, and Cryptosporidium species[4,5]. In the Asia-Pacific region, the distribution of enteric pathogens shows marked regional variations, with differences largely corresponding to the predominant socioeconomic status of each region. The Asia-Pacific region, comprising more than half of the world’s total population, is an area that is particularly diverse politically, economically, and culturally, including some of the world’s least and some of the most developed nations. While many in the Asia-Pacific region struggle to meet the most basic survival needs, a substantial proportion of the population in this region is moving towards Western diets and unhealthy lifestyles. The human gut microbiota is emerging as a major determinant of intestinal and non-intestinal diseases. The human gut is home to a diverse collection of microbes, collectively termed gut microbiota, the disruption of which is associated with gastrointestinal diseases. Moreover, it is becoming clear that geographic variations in the composition of the gut microbiota are likely to affect the risk of developing specific diseases. These geographic variations may be due to a number of factors, including diet, culture, and genetics. The relationship between disruption of gut microbiota and the risk of disease development and symptom severity suggests that the use of certain probiotics strains may prevent or reduce the progression of damage caused by some gastrointestinal illnesses. Probiotics are live microorganisms that when administered in adequate amounts confer a health benefit. While there exists a substantial body of literature regarding the use of probiotics in numerous human diseases, the quality of evidence for their use is variable, with evidence lacking for many indications. A number of organizations and institutions have reviewed the currently available evidence and developed recommendations for probiotics use at national or international level[10-14]. In order to propose recommendations for the use of probiotics in children of the Asia-Pacific region, a group of experts met to review and discuss existing recommendations, as well as the relevant available data regarding the proposed recommendations for Asia-Pacific. With the objective of formulating recommendations for use of probiotics in pediatric gastrointestinal disorders in the Asia-Pacific region, a working group of international experts in adult and pediatric gastroenterology from Asia-Pacific countries (Australia, China, India, Indonesia, Japan, South Korea, and Singapore), as well as from several countries outside the region (United States, Uruguay, United Kingdom, The Netherlands, and Italy) met to discuss the indication for use of probiotics based on local epidemiological conditions. Workshops on the gastrointestinal epidemiology of the represented countries and the use of probiotics in both adults and children were held. This article describes the proposed recommendations for use of probiotics in intestinal diseases in children in the Asia-Pacific region. The main considerations in the development of these consensus recommendations were the epidemiology and etiology of gastrointestinal diseases in the Asia-Pacific region, and the evidence from the region and internationally to support the use of probiotics for different pediatric gastrointestinal conditions. The method used to develop the recommendations consisted of multiple steps (Figure 1). Initially, target diseases and their impact were defined, and the definitions and outcomes for each disease were agreed upon. Published data and available evidence-based recommendations and guidelines from the Asia-Pacific region and from other organizations, such as the World Gastroenterology Organization (WGO), European Society for Pediatric Gastroenterology, Hepatology and Nutrition (ESPGHAN), North American Society for Pediatric Gastroenterology, Hepatology and Nutrition (NASPGHAN), Latin American Society for Pediatric Gastroenterology and Nutrition (LASPGAN), were studied and discussed. Subsequently, the local epidemiological and clinical features of the main intestinal diseases commonly seen in the Asia-Pacific region were discussed to determine their impact on the recommendations. Randomized-controlled trials (RCTs) on the effect of probiotics on gastrointestinal diseases, which were conducted in the Asia-Pacific region, written in English and published in peer review journals after 2005 were also evaluated. The discussion included epidemiological data, local practices and traditions, availability of probiotics and other drugs , standards of care, perception of specific disease risk and the need for prevention, economic considerations, and other health management issues (e.g., private vs public medicine). 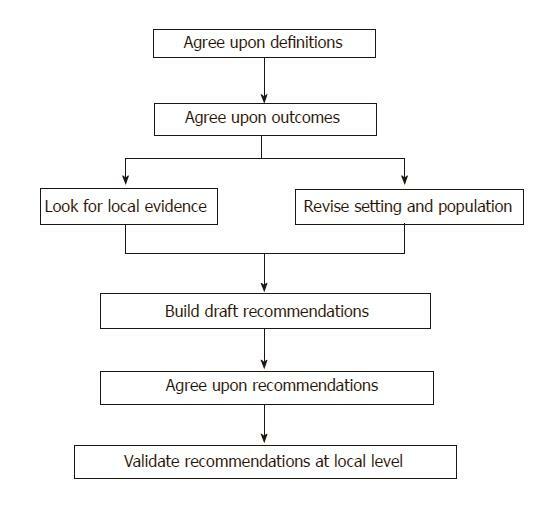 Figure 1 Steps for designing the recommendations for the use of probiotics in pediatric population in the Asia-Pacific region. The final recommendations were based on these steps using the GRADE system and the strength of each individual recommendation was rated as weak or strong. 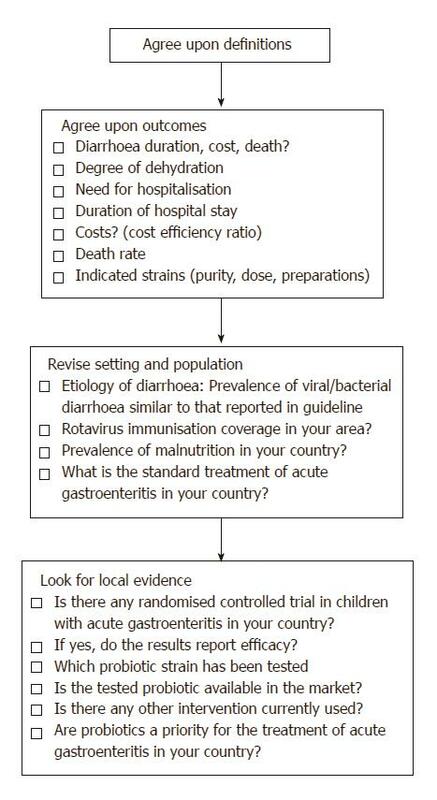 An overview of the steps used for designing the recommendations for acute gastroenteritis is shown in Figure 2. Figure 2 Steps for designing the recommendations for acute gastroenteritis. Once the recommendations were designed, the participants from the Asia-Pacific region were asked to provide a consensus on the proposed recommendations using the Likert scale. The recommendations were further revised based on the feedback received after circulating the proposed recommendations to countries in the Asia-Pacific region until final consensus was achieved as judged by agreement by all participants with grade 4 or 5 in the Likert scale (corresponding to “agree” and “strongly agree”, respectively). The final steps will be the validation of recommendations through field trials to evaluate their applicability and efficacy using previously tested methodology. The human gut microbiota includes a vastly diverse community of microorganisms that, together with the collection of all of the genomic elements of the specific microbiota, comprises the human gut microbiome. With the development of increasingly advanced molecular methods in recent years, such as high-throughput sequencing, our interest in and understanding of the human gut microbiome have significantly increased. It has become apparent that the microbiome is influenced by numerous factors, including age, geography, diet, lifestyle, disease, and antibiotic exposure[9,19,20]. Notably, while it has long been known that a course of antibiotics impacts the gut microbiome in the short term, there is also evidence to suggest that exposure to antibiotics may have a long-term impact on the human intestinal microbiota that persists for as long as 2 years after treatment. While much of the function of the human gut microbiome remains to be fully elucidated, we do know that the microbiota plays an important role in maintaining health. The role of microbiota includes the prevention of colonization by pathogens and development and activation of the immune system, as well as an important role in stability of metabolism. When the gut microbiota is functioning as expected in a healthy person, it is in balance or eubiosis. In contrast, in a number of diseases the gut microbiota exists in a state of dysbiosis. The composition of microbiota is altered in certain disease states, including enteric infections, Helicobacter pylori (H. pylori) infection and antibiotic-associated diarrhea (AAD). Furthermore, aberrations in microbial configuration are often associated with specific chronic diseases, producing a “microbial signature” of the specific disease[21,22], although the cause-effect relationship between microbial change and disease is not clear. There appears to be a link between dysbiosis and disease, including inflammatory bowel diseases (IBD), celiac disease, diabetes, cancer, obesity, and cystic fibrosis[22-24]. While patterns of diseases worldwide are constantly changing, diarrhea remains a leading cause of mortality among children younger than five years. The burden of this disease is not shared equally, but is disproportionately borne by children in low income countries, largely due to water and sanitation issues, as well as nutritional factors. Moreover, effective interventions are not provided equitably across all communities. Infectious diarrhea is a major concern in the Asia-Pacific region. Worldwide, the most frequent causative pathogen for infectious diarrhea is rotavirus, responsible for approximately 40% of all hospital admissions for diarrhea of infants and young children. A specific feature of certain Asian countries is the circulation of V. cholerae that may be multidrug-resistant and cause severe diarrhea. Other major pathogens include E. coli, Shigella, Campylobacter, and Salmonella species, as well as the protozoan pathogen Cryptosporidium that is an important enteric pathogen in children of some Asian Countries. The pathogens responsible for diarrheal deaths vary between regions. In a recent study, 5304 stool samples from Africa and Asia (Bangladesh, India and Pakistan) were analyzed and results show that approximately 80% of gastroenteritis in children are caused by six pathogens (Shigella, Rotavirus, Adenovirus 40/41, Heat-stable enterotoxin-producing E coli or ST-ETEC, Cryptosporidium and Campylobacter). Interestingly, Clostridium difficile (C. difficile) was an important pathogen in high-income countries, while Shigella and Aeromonas infections occurred at a higher frequency in areas with poor sanitation. In addition to infectious diarrhea, there are several other diseases of importance in the Asia-Pacific region, such as AAD (including C. difficile-associated diarrhea), H. pylori infection, irritable bowel syndrome (IBS), and IBD. The incidence of the latter condition is sharply increasing in some locations; however, the relative prevalence of individual diseases differs from region to region, as well as across countries within the Asia-Pacific region[29-31]. For example, H. pylori is found in half of the world’s population, although its prevalence and clinical manifestations vary markedly in relation to numerous factors, including geography, age and socioeconomic factors, with prevalence much higher in developing countries. In addition to epidemiological factors, the organizational and economic features that differ throughout Asia-Pacific countries play a major role in the implementation of treatment guidelines. Probiotics are live microorganisms that when administered in adequate amounts confer a health benefit. A substantial body of evidence suggests that the clinical effects of probiotics in humans include prevention and treatment of diarrhea, immunomodulation, and modulation of intestinal flora. The short-term effects of probiotics, such as those seen in patients with acute diarrhea, are due to the direct effect of specific probiotic strains on pathogens present in the human gut, whereas many of their long-term effects are the result of an interaction between selected strains and the host immune response or the reconstitution of the disrupted intestinal barrier. In general, the effects of probiotics are strain-, disease- and age-specific. Administration of multiple strains is not necessarily better or worse than a single strain, rather use of specific probiotic strains or preparations should rely on clinical data from at least one well-designed trial of a well-characterized probiotic preparation. Several meta-analyses combining data from studies of different probiotic strains in different patient populations produced results that were largely inconclusive[35-39]. Furthermore, the definitions and outcome parameters used in different studies are often heterogeneous, which may limit the interpretation of data available. Thus, although meta-analyses can be used to establish the effects of probiotics, they may underestimate the benefits of selected strains or amplify the efficacy of less effective strains if not performed appropriately. In addition, there is a high level of heterogeneity among microbial preparations, as well as a lack of quality control for commercially-available products. On the other hand, for selected strains and pathologies, there are a high number of well-conducted RCTs with compelling proof of efficacy[40,41]. Finally, it is recognized that the dose of probiotics used in children may be important, particularly when evaluating their efficacy in growing children, although currently data are limited. Safety and regulatory issues are also important considerations and may act as barrier against the use of probiotics. Overall, the available evidence suggests that probiotics are generally safe, with long-term studies demonstrating the safety of L. rhamnosus GG in very low birth weight preterm infants and probiotic strains (L. rhamnosus GG, Bifidobacterium lactis Bb-12, Lactobacillus paracasei ST11, and B. longum BL999) administered during the perinatal period. However, it should be noted that there are a number of potential risks associated with the use of probiotics, and there is limited data specifically addressing the safety of these agents[14,44]. To date, known risks associated with use of probiotics are largely confined to specific patient populations, including premature infants, immunocompromised individuals and critically ill patients[14,44]. A study on probiotics from dietary supplements reported the presence of antibiotic resistance in selected strains, although further studies exploring the mechanism by which this resistance is conferred are warranted. The current regulatory scenario of probiotics provides a scattered picture, with probiotics classified as food additives or as drugs in different countries. For instance, in Indonesia, probiotics are classified as supplements, and some strains (including Saccharomyces boulardii) are not available due to these regulations. A recent paper provides an overview of how probiotics are categorized in the world. Furthermore, L. rhamnosus GG is not commonly used in Japan, where L. casei Shirota-fermented milk is widely available. The implementation of the recommendations for the use of probiotics is likely to be influenced by those factors. Based on these findings, and keeping in mind that the main basis for prescribing probiotics is the data on clinical efficacy, the experts produced the following recommendations for intestinal diseases of children in the Asia Pacific region. The proposed recommendations could be modified according to the country-specific level of evidence. Infectious diarrhea is the best established indication for probiotics administration in childhood. A position paper by ESPGHAN for the use of probiotics in the management of acute gastroenteritis in infants and children proposed that since the effects of probiotic are strain-specific, the recommendations for the use of an individual probiotic should be made based on the efficacy and safety of the probiotic from well-established RCTs and that the efficacy and safety of a particular strain should not be extrapolated to another strain. Furthermore, a probiotic preparation should be selected from a manufacturer who has adequate quality control, and the lack of current evidence on the use of a particular probiotic does not mean that it will prove to be ineffective in future studies. According to the ESPGHAN/European Society of Pediatric Infectious Diseases guidelines for the management of acute gastroenteritis in children in Europe, probiotics provide an “active therapy” to reduce the duration and severity of symptoms. The guidelines strongly recommend the use of probiotics as an adjunct to rehydration therapy. Based on large number of high quality RCTs, L. rhamnosus GG and S. boulardii were recommended (Table 1). L. reuteri DSM 17938 was also included in the list of effective strains, albeit with a weak recommendation. Few RCTs are available for other strains or combinations of strains in children with acute gastroenteritis. Some RCTs were conducted in Asian countries with variable results. A double-blind randomized trial found probiotics to be ineffective in acute diarrhea in Indonesian children. However, because data are limited or have methodological issues, many strains were not considered for inclusion in the present recommendations. Table 1 Recommendations for use of probiotics in childhood intestinal diseases by geographic region. 2For mildly active UC. T: Treatment; P: Prevention; AAD: Antibiotic-associated diarrhea; CDAD: Clostridium difficile-associated diarrhea; CD: Crohn’s disease; IBD: Inflammatory bowel disease; IBS: Irritable bowel syndrome; UC: Ulcerative colitis; VSL#3: Proprietary mixture of eight probiotic strains. A position similar to ESPGHAN was taken in the United States, where the indications for probiotics were discussed in the 4th Triennial Yale/Harvard Workshop on Probiotic Recommendations. Similar recommendations were published in South America, and the Latin-American consensus guidelines on the use of probiotics in pediatric gastroenterology suggest that L. rhamnosus GG, S. boulardii, and (with a weak recommendation) L. reuteri are effective against diarrhea and should be introduced at the onset of gastroenteritis. The WGO also published a position paper on the indications for probiotics in adults and children. The recommendations made for the use of probiotics in acute gastroenteritis, according to main geographic region and indication, are summarized in Table 1. Other national and international guidelines provide recommendations for the management of gastroenteritis. A group of experts examined 15 guidelines from all over the world for management of acute gastroenteritis in children, of which nine guidelines recommended the use of probiotic strains for treatment of gastroenteritis. In most guidelines, the recommended strains included L. rhamnosus GG and S. boulardii. Notably, selected countries in the Asia-Pacific region have adopted guidelines recommending effective use of probiotics for management of gastroenteritis. A study conducted in India explored deviations from the WHO guidelines in the management of diarrhea in children. The most common deviation from the WHO guidelines was in relation to the addition of probiotics. This study also found that the use of probiotics reduced the duration of symptoms. The panel of experts also discussed the etiological patterns, features, and the risk factors for acute gastroenteritis. It was observed that the epidemiology of enteric pathogens, the features of disease, the incidence of risk factors (mainly childhood malnutrition) and the organization of health care provide a broad and variable picture in the Asia-Pacific region. While the efficacy of probiotics is not strictly related to the etiology, it is likely that the highest efficacy is exerted in viral rather than bacterial gastroenteritis. Overall, most guidelines recommend the same probiotic strains for active therapy of gastroenteritis, based on consistent data showing similar efficacy of recommended strains in various settings and conditions. However, the progressive introduction of immunization against rotavirus may alter the etiologic and epidemiologic pattern of gastroenteritis, as already reported in many countries including countries in the Asia-Pacific region. Norovirus is an emerging etiologic agent, and data regarding the efficacy of L. rhamnosus GG, S. boulardii, and other probiotics against this virus are limited. It was also noted that there are no clear data about the efficacy of probiotics in patients with cholera, although there is weak evidence that probiotics may have some preventive effect. Furthermore, there is little evidence regarding the efficacy and safety of probiotics in malnourished children. Since the incidence of malnutrition is high in several countries with poor living conditions in the Asia-Pacific region, additional studies are needed to specifically address the use of probiotics in gastroenteritis in undernourished pediatric populations living in these regions. After discussing the current evidence and issues regarding the use of probiotics, the expert panel agreed upon recommending L. rhamnosus GG and S. boulardii CNCM I-745 for management of gastroenteritis in the Asia-Pacific region as an adjunct to rehydration. Inclusion of L. reuteri DSM 17938 may also be used although the quality of evidence for the latter strain is weak. AAD is a major global issue, with children being at a higher risk than adults. AAD has become an important problem due to the general overuse of antibiotics in children in most Asia-Pacific countries[29,56]. C. difficile is a major causative agent for AAD, both in terms of frequency and severity. Available data suggest that probiotics, including L. rhamnosus GG and S. boulardii CNCM I-745, are effective in the prevention of AAD and C. difficile infections in pediatric populations[57,58]. The ESPGHAN working group recommendations on the use of probiotics for prevention of AAD in children suggest that physicians should evaluate the risk factors for the occurrence of AAD or C. difficile-associated diarrhea, such as the class of antibiotics, duration of antibiotic treatment, need for hospitalization, age, comorbidities, and previous episodes of AAD or C. difficile-associated diarrhea, before making decisions on the use of probiotics for the prevention of AAD in children. The working group provides strong recommendations for the use of L. rhamnosus GG or S. boulardii CNCM I-745 for AAD prevention and a weak recommendation for the use of S. boulardii CNCM I-745 for the prevention of C. difficile-associated AAD. Direct clinical data are available from the Asian region. A study conducted in China evaluated the efficacy of S. boulardii for the prevention and treatment of diarrhea in children receiving intravenous antibiotics for lower respiratory infections. Administration of S. boulardii was associated with a significantly reduced risk of developing AAD (RR = 0.22, 95%CI: 0.1-0.5) and a reduction in the duration and severity of diarrhea. But, in a recent Korean study, the use of probiotics was not associated with any significant differences with regard to prevention of C. difficile infection. The expert group supports probiotic administration for the prevention of AAD. Either L. rhamnosus GG or S. boulardii CNCM I-745 should be administered as treatment, whereas based on available clinical evidence, the best option for prevention of C. difficile-associated diarrhea in children is administration of S. boulardii CNCM I-745. Nosocomial diarrhea is an important issue in the Asia-Pacific region, mainly due to the high frequency of rotavirus infection. Any coexisting respiratory infection can amplify the impact of nosocomial diarrhea, resulting in exacerbation of the clinical condition. Although evidence regarding the efficacy of probiotics in the prevention of nosocomial infections remains unclear, available data show that L. rhamnosus GG may be effective in the treatment of intestinal nosocomial infections in children[63,64]. Based on available data, the expert group recommends that administration of L. rhamnosus GG can be considered in hospitalized children for the prevention of intestinal infections. Traveler’s diarrhea was also discussed during the meeting and it was observed that there is no strong evidence of an increased risk of diarrhea among children who live within the Asia-Pacific region and travel elsewhere. In addition, data on the efficacy of probiotics in preventing traveler’s diarrhea are insufficient to provide recommendations. Nevertheless, the Latin-American consensus guidelines recommend S. boulardii for the prevention of traveler’s diarrhea in children based on RCT evidence. L. rhamnosus GG and L. acidophilus appear to be ineffective, while there is some limited evidence that S. boulardii administration is associated with a significant reduction in diarrhea incidence. The expert group does not recommend the use of probiotics for the prevention of traveler’s diarrhea in children in the Asia-Pacific region. Early studies on the epidemiology of functional intestinal disorders in the Asia-Pacific region suggest that these conditions are common. According to the WGO global guidelines, several studies have demonstrated significant therapeutic gains with probiotics over placebo in the symptomatic treatment of IBS, although most trials were performed in adults. A reduction in abdominal bloating and flatulence as a result of probiotic treatment is a consistent finding in published studies, and some strains (including B. infantis 35624) may also reduce abdominal pain and provide systemic relief. However, there is only limited evidence on the efficacy of probiotics in the treatment of functional intestinal disorders in children[37,67,68]. Based on available data, there is insufficient evidence to recommend probiotics in the treatment of functional intestinal disorders. Colic is a disturbing condition in infants that frequently requires medical consultation and therapy. Dysbiosis may affect gut motor functions and gas production, resulting in colicky abdominal pain in infants. Data from RCTs indicate that probiotics may be effective for the treatment of infant colic, with L. reuteri being identified as the most effective strain[69,70]. If infant colic is perceived as a problem in need of active intervention, administration of effective probiotics, particularly L. reuteri DSM 17938, may be considered. As shown in Table 1, the WGO global guidelines address the role of probiotics in IBD, particularly ulcerative colitis and Crohn’s disease (including pouchitis). Regarding pouchitis, there is good evidence for the efficacy of VSL#3 (a mixture of eight probiotic strains including Lactobacilli, Bifidobacteria, and Streptococcal species) in preventing the initial episode and further relapses of pouchitis after induction of remission with antibiotics. Overall, the guidelines conclude that probiotics are recommended for patients with pouchitis of mild activity or as maintenance therapy for those in remission. For ulcerative colitis, the guidelines suggest that E. coli Nissle may be as effective as mesalazine in maintaining remission of ulcerative colitis, and that VSL#3 has efficacy in the induction and maintenance of remission of mild to moderate ulcerative colitis. For Crohn’s disease, the guidelines note that probiotics are less effective, as reported in a Cochrane systematic review, which concluded that there is no evidence to indicate a beneficial effect of probiotics in the maintenance of remission in Crohn’s disease[34,71]. Other guidelines are less open to consider probiotics as a general intervention for intestinal inflammatory conditions (Table 1). The expert panel concluded that overall, there appears to be limited evidence to support the use of probiotics for the treatment of IBD in children. In pouchitis, VSL#3 may be considered based on evaluation of individual cases. H. pylori infection is a major concern in most Asian countries[72-74]. In addition the rate of H. pylori antibiotic resistance is high in Asian population. A review on the use of probiotics in the treatment of H. pylori infections in children indicates that probiotics may be beneficial in improving the eradication rate of H. pylori infections and a meta-analysis of RCTs provided further support. However, these effects are strain-specific and additional long-term studies are needed to establish the efficacy of different strains and doses of probiotics in the management of these infections. A systematic review and meta-analysis of 11 RCTs, including a total of 2200 participants (among whom 330 were children), found an increase in H. pylori eradication rate with the addition of S. boulardii to antibiotic treatment. Eighty percent of patients in the S. boulardii group achieved eradication of H. pylori compared with 71% of patients in the control group (RR = 1.11, 95%CI: 1.06-1.17). Moreover, compared with controls, S. boulardii reduced the overall risk of H. pylori therapy-related diarrhea. However, since the number of children included in the studies was limited, additional studies in children are warranted. WGO global guidelines report that several Lactobacilli strains appear to reduce the side effects of antibiotic therapies for H. pylori and improve patient compliance. However, while there is evidence to suggest that supplementation of H. pylori antibiotic treatment regimens with certain probiotics may help eradication, the guidelines state that “there is currently insufficient evidence to support the concept that a probiotic alone, without concomitant antibiotic therapy, would be effective”. An international consensus document, developed following the 5th Maastricht/Florence Consensus Conference in 2016, concluded that certain probiotics (such as Lactobacilli and S. boulardii) show favorable results as adjuvant treatment in H. pylori infection for reducing side effects, with a positive effect on patient compliance with the extensive antibiotic regime. In a recent meta-analysis the efficacy of probiotics administration in improving eradication rates and in reducing side effects of therapy was confirmed. In subgroup analysis there was no difference between Asia and Europe, but probiotics were more effective in children than in adults. However several strains, including S. boulardii, were effective and may be considered in adjunct eradication therapy. Based on available data, the Asia-Pacific expert panel suggests that probiotic strains with evidence of efficacy, such as S. boulardii CNCM I-745, may be considered for the prevention of side effects of antibiotic therapy for H. pylori and for improving eradication rates in children. There is a strong debate within the scientific community about the use of probiotics for the prevention of necrotizing enterocolitis (NEC). Several studies have reported that probiotics reduce the incidence of NEC and NEC-associated mortality in preterm infants and several meta-analysis have confirmed these results[79,80]. However, a rigorous phase 3 RCT recently showed no effect of B. breve BBG-001 on NEC. Several guidelines and position papers reported that although a substantial body of evidence supports the use of probiotics, there is insufficient evidence for a strong recommendation nor is there consensus on specific strain. The expert panel agreed that probiotics may be considered for the prevention of NEC as there is evidence that the risk of NEC and the associated mortality may be reduced in high-risk populations. However, since there is no conclusive agreement on whether to administer probiotics, the decisions should be taken in agreement with the parents, in light of current evidence and the benefits expected. A summary of all recommendations for the use of probiotics in children is shown in Table 2. Table 2 Proposed recommendations for the Asia-Pacific region with grade and strength of recommendations. 2For prevention of antibiotic-induced side effects and possible increase in eradication rates. T: Treatment; P: Prevention; AAD: Antibiotic-associated diarrhea; CDAD: Clostridium difficile-associated diarrhea; IBD: Inflammatory bowel disease. Clinical practice guidelines are important tools for translating the evidence available into clinical best practice. The development of guidelines for probiotics use is often hampered by several factors, including lack of characterization of probiotics, inadequate quality control of preparations and a paucity of high quality studies. Nevertheless, well defined clinical indications for the use of probiotics have been established, and more are emerging. Guidelines that have been developed in one country may not be applicable in other countries, depending on the prevalence and etiology of the clinical condition, as well as the availability or cost of recommended interventions and the organization of health care. Therefore, guidelines should generally be developed for individual countries or regions. As outlined in the previous sections, the burden of intestinal diseases differs across geographic regions, particularly between countries in the Asia-Pacific region. These differences are due to numerous factors that must be taken into account when developing guidelines for the prevention and treatment of intestinal illnesses in children in the Asia-Pacific region. However, despite the largely socioeconomic disparities that exist between countries, the proposed recommendations were agreed upon by all participants to the panel coming from different countries in the Asia Pacific region, as judged by the Likert scale voting and provide guidance for physicians on the use of probiotics in specific intestinal diseases, thereby filling a gap that exists, as similar documents are available for other major regions of the world. Factors that must be taken into consideration in terms of the applicability of the Asia-Pacific guidelines include the availability of specific probiotic strains in local markets, costs, patient and physician access to probiotic products, and personal/cultural beliefs. Moreover, current regulations regarding probiotics are country-specific in the Asia-Pacific region, as well as in other countries in the world. Standardization of a regulatory framework for probiotics would be of substantial benefit in terms of furthering research into and the use of these agents in human medicine. Given this complex scenario and the need for supporting evidence, the recommendations are provided as “proposed” and their potential benefits need to be confirmed at the local level with well-conducted RCTs. Acute gastroenteritis: Administration of probiotic strains for which there is good quality evidence of efficacy should be considered in adjunct to oral rehydration therapy in children with acute gastroenteritis. This recommendation does not include children with severe malnutrition. At present, S. boulardii CNCM I-745 and L. rhamnosus GG are the two strains for which there is compelling evidence of efficacy. L.reuteri DSM 17938 may be considered albeit proof of efficacy is less consistent. Antibiotic-associated diarrhea: Upon evaluation of local conditions and risk factors, probiotics administration may be considered on a case by case basis for the prevention of AAD. S. boulardii CNCM I-745 and L. rhamnosus GG are two strains for which the quality of evidence is good. C. difficile infection: For the prevention of C. difficile-associated diarrhea, probiotics may be considered based on evaluation of individual cases. At present, the recommended strain is S. boulardii CNCM I-745 for which the quality of evidence is low. Prevention of nosocomial diarrhea: Upon evaluation of local conditions and risk factors, probiotics may be considered to prevent hospital-acquired intestinal infections and diarrhea on a case by case basis in children admitted to hospital. Although the evidence remains weak, L. rhamnosus GG is the strain recommended for this indication. Traveler’s diarrhea: Data on the efficacy of probiotics in preventing traveler’s diarrhea are insufficient to provide recommendations for the use of probiotics. Functional intestinal disorders: Based on available data, there is insufficient evidence to recommend probiotics in the treatment of functional intestinal disorders. Infant colic: Probiotic administration may be considered for the treatment of infantile colic. At present, the recommended strain is L. reuteri DSM 17938, for which the quality of evidence is weak. Inflammatory bowel disease: There is no strong evidence supporting the treatment of IBD with probiotics. In pouchitis probiotic therapy may be considered based on evaluation of individual cases. At present, the recommended probiotic preparation is VSL#3 for which the quality of evidence is weak. H. pylori treatment: Probiotics administration may be considered for the prevention of side effects and improving eradication rates in children undergoing therapy for H. pylori. The recommended strains include S. boulardii CNCM I-745 and others for which the quality of evidence is weak. Necrotizing enterocolitis: Probiotics may be considered for prevention of NEC in high-risk populations as there is evidence that the risk of NEC and the associated mortality may be reduced. However since there is no agreement on strains, indications and scheme, the decision should be taken in agreement with the parents, in the light of current evidence. The authors would like to thank Marie Cheeseman, who wrote the first draft of this paper.